Why the rosary? How does the rosary have anything to do with our fight against secularism, relativism, and heresy? You might be a non-catholic wondering about the claims of the rosary and how they square away with your beliefs. Or you might be a practicing Catholic who is puzzled that the “weapon of choice” for this battle against the secular monster is simply prayer beads. St. Padre Pio called the rosary a weapon- because that’s exactly what it is. A weapon. It’s not just some fuzzy-feeling meditation-the very gates of hell tremble when the rosary is prayed fervently. As Catholics, we know that the prayers of the holy rosary are more than just “vain” repetitious words. 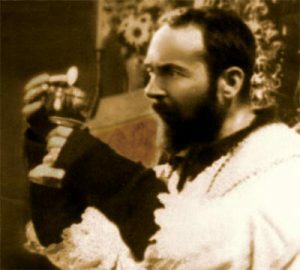 Saint Padre Pio states that “The Rosary is the ‘weapon’ for these times.” If we truly focus on the meditations of the mysteries, we examine deep into the heart of the Gospel of truth. Some might still be thinking “Why the rosary?” The simple answer is because it’s powerful. Because it requires discipline. Because it fosters a love for the Immaculata and asks for her powerful intercession. The secular culture is also powerful and requires no discipline whatsoever. Rather, it promotes instant selfish pleasure. It is built on lies and the twisting of good and evil. If we are ever going to shake the very foundation of falsehood that the secularism is built on, we must arm ourselves with the truth. Praying the rosary is such a powerful way in which we will begin to take down the secret walls of hidden shame in our homes; praying the rosary for those nailed down by addictions of this world is the silent prescription for this disease. The rosary is the Gospel on a chain. In many third-world countries, as in times before the printing press- the Bible was and is unavailable to the common man. For some, owning a personal copy of scripture was and is a luxury. How do those people know the Gospel truths? One time tested way is the regular recitation of the rosary. There are many Christians who have never personally read one page of Holy Scripture, but they know the saving message through a devotion of the rosary. They know Him personally because they pray the rosary. While reciting the rosary, we mediate on the essential moments of Christ’s life and on the life of Christ through His Mother’s perspective- a perspective that knows Christ more than we can ever hope too. The prayers of the rosary help us gain insight into the One who is the Divine Truth and Truth Giver. Not only do we arm ourselves with the truth, but we also implore the one who is the Mother of Truth to act with us. In the rosary we ask the model of purity herself, Mary, to pray for our purity. When we gain the intersession of our Blessed Mother, we gain all the power heaven can yield. St. Josemaria Escriva declares “If you say the Holy Rosary every day, with a spirit of faith and love, our Lady will make sure she leads you very far along her Son’s path.” We have a Goliath to take down and just as David had five stones in his arsenal, we have five decades in ours. So grab those beads and start praying, this beast must go down!